In a quiet peaceful village, adobe walls surround spacious compounds filled with the sound of children at play, the bleat of goats. The village sits on the fertile Punjab plain, green fields of grain and grass stretch out to meet the next village. Water, close to the surface, irrigates the rich harvest of city landlords. 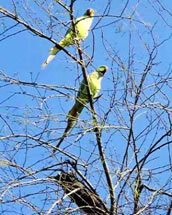 I am resting in my friend’s compound in a comfortable chair in the shade, watching a pair of parakeets in the neighbour’s acacia tree. I try to photo them as they swoop and sit, coo and cluck to each other. The spring cycle of life has begun. Earlier that day, I visit the compounds of women who want to meet me; my presence in this little place is an unexpected and unusual event. They welcome me into their outdoor kitchens; I like the stark modernity of the mud walls and rooms. The women offer tea, introduce their children, I pet the goats and sometimes they show off their fine embroidery. I admire their simple homes, made bright with colourful fabric. The women themselves in their traditional pant and dress outfits in many hues are like the brightly coloured birds. 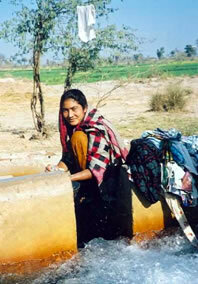 Later I walk out to the fields where women are washing clothes in the irrigation tanks. Water gushes out cool and clear, making the chore easy while jokes and stories are told. I add to the jokes, by pretending to undress and bathe with them. Allessia, a young woman from the compound where the parakeets perch, laughs hardest at my pantomime and at my friend’s shock. Allessia is one of many members of a woman’s group that organized a music and drama presentation for my benefit. Skits of marital discord and family problems were interspersed with traditional song and dancing. Women talk to me individually about hardship and limitations to their lives. But compared to the urban squalor, poverty and crowding of many Asian cities, this tranquil village seems to be a better place to live. Months after I return home, I get the news: Allessia is dead at 26 years. Murdered by her brother and uncle. Allessia was home alone a lot caring for her other relatives while the parents were working with animals. In September she left and went to live in another village with a friend of her brother. The man was married, but polygamy is legal there and he promised to marry her. Her brother, Noor, and uncle, Anthony, came after her and abducted her back to her parents’ home. She told them she wanted to be with this man, that she was not kidnapped by him. And so the two men beat her until she died and threw her body out in the road for children to see on their way to school. Her mother, Mabel, has had so much sorrow that she has become demented. Her older daughter, Nasreen, left her abusive husband and came home to die of hepatitis. The other daughter, Mariam, is married, but is sick also and, greatest of shames, has not had a child. There is little health care in the village and certainly no trauma counsellor for the grief- stricken mother. The man who Allessia went away with is not popular in his community but nor is he censored for wife beating or adultery. The confessed murderers went to jail for a few months. Their wives and families wanted them home to provide support. They are free, back in the village. Allessia in her short life and violent death has become a statistic. She is one of 1400 women murdered in Pakistan every year by male relatives. Amnesty International says that women in Pakistan live in fear. They know they will be punished if men decide they have brought shame on the family. This shame can be defined as anything a woman does by her own will, for her own independence or self- determination. All human beings are born free and equal in dignity and rights. They are endowed with reason and conscience and should act towards each other in a spirit of brotherhood. Women are commodities in this village, this nation and many other countries. In Pakistan, murder is a punishable crime. Pakistan has signed the Universal Declaration of Human Rights. Yet these men, and others like them, go free. They are even admired and praised. The government makes noises about legal action against murders, but little legal action is taken. Amnesty has prepared a list of 15 human rights abuses against women and girls. There is a common and rather odious expression in our society – usually hurled as an insult: Get a life! In this pretty village in the Punjab, getting a life can mean literally: Get a brutal death . I remember Allessia and think of the birds in the trees that have more freedom than she or her sisters could ever know. And today, four more women in Pakistan were murdered. I don’t know their names, but I can hear their cries. Write to the Pakistan High Commissioner and ask for information about “honour killings” and request that murderers be charged and tried under Pakistan law for their crimes. You might ask why so many murderers go free.